Your morning commute can get a bit dull after a while. Now you can get the power and luxury of a sports car with the practicality and versatility of a hatchback. 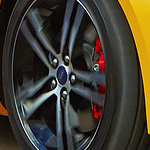 The Ford Focus ST is a popular compact car with a sporty look and impressive performance. This sleek modern car also has some impressive technology features that will enhance your driving experience. With the SYNC® Enhanced Voice Recognition Communication and Entertainment System, you can control your favorite music while keeping your eyes on the open road. The 4.2 inch color LCD display can be configured to display the information you need to get to your destination. These technology features are only a sample of what the Ford Focus ST has to offer. To see for yourself, visit Vanderhyde Brothers Ford Inc. to take this innovative hatchback for a test drive.